General information on amino acids. Is there a better alternative to Amino Acid Table Widget? Is Amino Acid Table Widget really the best app in Card and Board category? Will Amino Acid Table Widget work good on macOS 10.13.4? 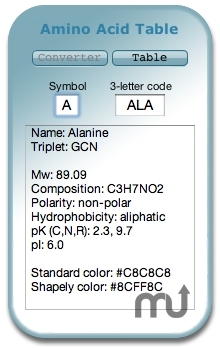 The Amino Acid Table widget displays general information on amino acids conformed with the IUPAC-IUB recommendations. Version 1.2: New information on molecular weight, composition, polarity, hydrophobicity, pK and pI for amino acids. Amino Acid Table Widget needs a rating. Be the first to rate this app and get the discussion started!